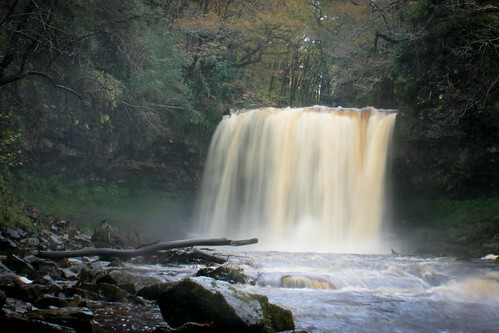 I went to Wales last weekend to do some camping and walking in Brecon Beacons National Park.  Camping and walking I did, as well as a bit of thinking, but not about life, the future, and other deep things I thought I’d have headspace for. Instead, I kept my head in the trip, looking at maps, planning my adventures, plotting my next campfire meal and often just willing one foot after the other up the slope of a big hill. The last time I was in the Brecon Beacons it was for a short holiday and I swore I’d come back soon to do some real walking in the hills. In my momentum, I even bought Bob Greaves’ Walk The Brecon Beacons book of circular walks. That was August 8th, 2010, and it’s taken me this long to use it. Day 1: Walk up Pen y Fan (886m), the highest point in Southern Wales and south of Britain. It was about 10 miles, and took about 6 hours. Day 2: Shorter, low-ish level walk up Fan Frynych (629m) near the Visitor’s Centre. It was a miserable, windy, wet day, but I had the will and the waterproofs. It was about 5.5 miles, and took about 3.5 hours. In between walks, I paid a visit to Penderyn Distillery, Lllanthony Priory and Sugarloaf Vineyards, an unexpected pleasure and the second highlight of my trip. It was Sunday, nearing sunset, and the sun was actually shining and it was warm enough to go without a jacket. It all just felt perfect, exactly what I was after: a stroll around the vines in warm sunshine followed by a sit-down at their outdoor cafe to write postcards and taste some of their (fairly decent) wine. This was the first time I’ve ever done any serious walking by myself. I hadn’t really thought about this ahead of time, but in retrospect, I definitely should have given this greater consideration. I’m not sure if my American friends quite grasp what it’s like walking in the British countryside. There is an amazing array of public footpaths across the country that allow you to walk almost anywhere. But many of these footpaths are not well marked, they intersect other footpaths and little roads, and are often times not hugely travelled (I’ve been on many walks in the countryside where I haven’t passed a single person the whole time). These aren’t the well-marked “hiking paths” that you get in the States, with maps along the way and colourful markers guiding you back to the car park. This is proper adventure territory, and it’s one of the things I love most about living here. But after last weekend, I see now that I’m going to have to be extra prepared if I take them on alone. Yes, there is a story here. After I walked up Pen y Fan, I accidentally came back down the wrong side of the ridge and had to walk an extra two hours to get back to my car. I only had my silly little book of walks with a tiny map that didn’t cover the side of the ridge I found myself on. Fortunately it was a beautiful day and lots of people were walking. I met a really nice couple with an OS map headed in my direction, so I found my way back with them, along a myriad of winding, intersecting small country roads, and had a really nice conversation about Spanish cheese and Somerset pubs along the way. Later that night it occurred to me that if I hadn’t ran into that couple, I would have been thoroughly lost (need I note the irony that I actually sold my GPS on ebay a week prior?). Thinking about this made my heart skip a beat, and the very next day I went to the Visitor’s Centre and bought OS maps. Learnings from this: when walking alone, be super well-equipped for navigation. This includes proper OS maps, a compass, and dare I say a GPS. Also bring LOTS of water and snacks just in case you do lose your way. The Ramblers charity also has an excellent article on Health and Safety for Walkers that advises a survival bag, torch, whistle, additional warm clothing, high-energy food, water purification tablets and a first aid kid. 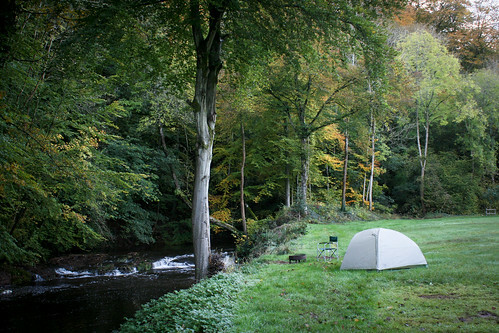 I had a fantastic campsite at Priory Mill Farm just outside of Brecon, perched on the river Honddu. The weather scared most people away and I had the place mostly to myself. The facilities were basic, but clean and modern, and best of all, they had big braziers so you could have a campfire in the evening: an essential element of camping in my world. I love a good campfire meal but I didn’t really have my camp cooking mojo on this trip. Part of this was down to darkness and weather. The first night I managed one of my camping guilty pleasures: veggie hot dogs on an open fire. But it was so dark and cold that I didn’t really feel relaxed. And the second night was so rainy that all I could do was huddle in my tent and make veggie chilli in the vestibule (I love my vestibule). I had grand plans for great campfire meals, including the now longed for veggie chilli with sweet potato and corn on the cob baked on the coals, plus grilled peppers and onions. But these will have to wait for better, brighter weather. 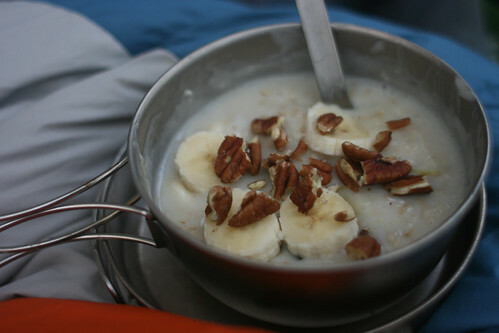 Oddly, I think my favourite camping meals were my simple breakfasts: very milky porridge with raisins, apples, bananas and pecans. Warm and comforting on cold mornings, and happily consumed from within the warmth of my sleeping bag. Did I say how much I love my vestibule? My tent is a Big Agnes Emerald Mountain 2-person tent. In many ways, this tent is silly, largely stemming from its lack of symmetry. However, the vestibule makes it worth it. With the vestibule, it could be raining but I can still be in my sleeping bag, cooking a hot breakfast and making coffee, without getting wet. Quality! One thing I hadn’t thoroughly considered before this trip is how early the sun sets these days. I knew it would be cold, and so packed extra blankets accordingly, but the dark surprised me. Headlamps are all very well and good, but what I really needed was a lantern. I was able to pick up a small one for my tent which proved very handy, but a larger lantern that illuminates a larger outdoor space would have been very handy for Friday night’s campfire cookout. I also wonder how to best approach the perpetual dew that’s on the ground this time of year. I wondered if wellington boots would have been better campsite shoes than my Solomon waterproof trainers. One thing is for certain, as this is car camping, a designated pair of bone-dry shoes for non-walking, non-campsite activities is a must for next time. Waterproof map case – I think about this every time I walk in the rain and I really have no good excuse for not getting one yet. I think I tell myself I’ll improvise but I never do. Waterproof cover for my day pack (and possibly a waterproof liner for my camera and books). Waterproof gloves – I have a pair of VERY warm Gore-Tex gloves for winter but a lighter pair would have been nice, not only to protect against water, but wind too – by the end of my rainy windy Saturday walk my hands were numb. 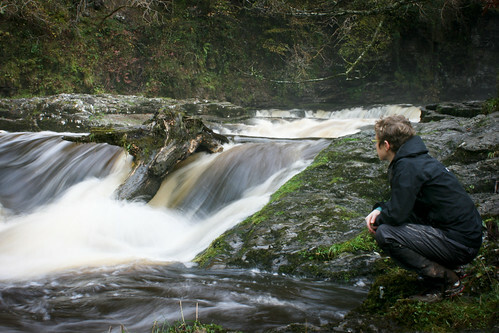 Better waterproof trousers – the ones I have let water in after about an hour of steady rain. Not ideal. I should have waterproofed my boots. 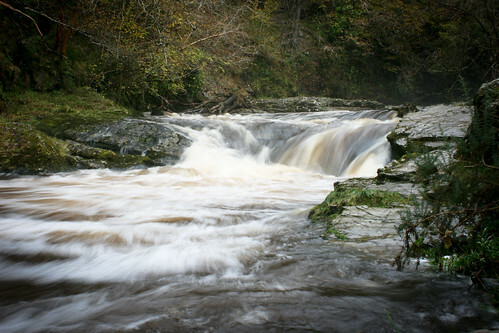 By the end of Saturday, water had started seeming in. Grrr. They are usually AWESOME but it’s been a while since I treated them with waterproofing stuff and should have reapplied before my trip. I’ve been to Wales before, including Brecon Beacons and Snowdonia. Every time I go I feel like I’m in a different country: weather and seasons work together to create an ever-changing environment that definitely left me wanting more. Next time I’d like to explore the Black Mountains and the Vale of Ewyas.I had a brief drive through this area on my way home, via a quick look at Llanthony Priory, and looking at the hills and colours at sunset sealed the deal. But this probably won’t be until next year. Which reminds me, Christmas is coming and this trip has given me lots of ideas for things to add to my wishlist: lantern, better waterproof trousers (Carl Legge recommends Paramo brand, and they even make sizes for short people! ), waterproof cover and liner for my daypack, some kind of lighter weight waterproof gloves (do these even exist?). So it seems, as much as I’m usually almost minimalist to a fault, when it comes to camping I’m a bit of a gear head. What can I say, I like to be comfortable. The last thing you want is wet shoes or a waterlogged camera; you want to do whatever possible to enjoy the walk as much as you can. Isn’t that the point? Great article Monica! I really liked what you set out to do and did. It sounds like typical conditions for the time of year but pleased you got some sun. Definitely want to check out the Penderyn distillery. 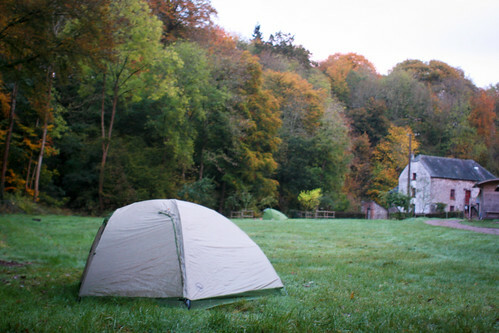 I think a summer of camping round Wales is on the cards in the next few years so will have to swap tips! If you can get to the Conwy Valley in North Wales, thats a great spot. Thanks, Stu. Penderyn distillery was OK – but if you’ve been to one semi-commercialised distillery you’ve been to them all, right? Still worth a stop for a taste – it’s quite good! 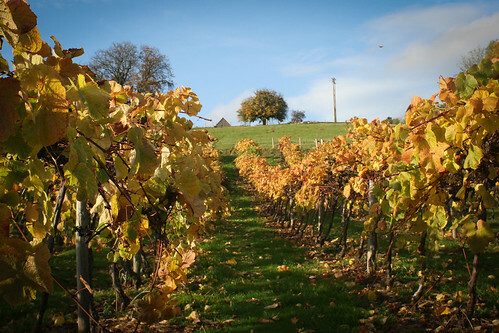 The vineyards were way better, IMHO. Will keep Conwy Valley in mind – it’s easy enough to get to! A really interesting post and some great lessons. OS 1:25,000 map & compass really essential. ALso, knowing how to use them properly is as important. I took myself on a refresher course a few years aso just to check I still had the stuff sorted and learnt useful stuff. We have a great guide up here who is fun and brilliant if you fancy some lessons. If you’re walking alone, having a route card with timings and possible escape routes very useful. You could use a twitter friend to act as your back stop and who would phone the emergency services if you hadn’t checked in by the agreed time. Could save you an uncomfortable or worse night. For additional tent lighting consider cyalume glow sticks or similar. I got a whole load from ebay very cheaply. Best waterproof map case I’ve used is the ortlieb. Has a roll down top that makes it very watertight. Also consider drybags for keeping your kit dry inside your rucksack if you don’t already have them. Best gloves I’ve used are Sealskinz. They do a range of types/sizes and are great. Sealskinz socks are waterproof and very warm and help to keep you dry even when you’ve gone into water over the tops of your boots. Wow, Carl – thanks for all the great advice! You know, a course on this stuff is a GREAT idea. Tell me who your guide is. I’m sure there are some my way but if he’s that good it might be a good excuse to venture further field and see something new. I LOVE ortlieb’s stuff – I have their panniers for my bicycle but didn’t know they did map cases. Have added to my wishlist along with a few other things. 🙂 And big yes to drybags – particularly for camera and notebooks (my moleskin is a crinkled mess now). I’ve seen Sealskinz gloves but wasn’t sure how good they were – like that they’re Merino wool based. Waterproof socks also a good idea. Time to update my ultimate car camping checklist! It sounds like the trip could have been dreary and rainy and miserable (and maybe it was–I know I often find that I make things sound better on my blog! ), but you sound like you really turned it into a treat! The countryside is gorgeous up there, I’ve never been to Wales & always had it on my list, but I’m thinking summer might be a better visiting time. 🙂 Also, walking in the UK sounds incredible, even if everything isn’t well marked. 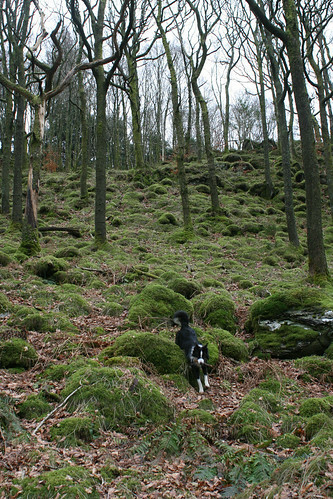 Since I first read about from British nature writers, I fell in love with the idea–it seems like over here everything is too delineated and sectioned into public-private space. The UK’s walking paths make it more open, a neat concept. But a GPS does sound ideal! Anyway, beautiful pictures & I’m glad you were able to get away for a couple of days and get outside!! Haha – there were certainly moments of dreariness and misery but I tried to have a “what can you do?” attitude about it all. It’s cool. I too think summer would be better for Wales and am already looking forward to next year’s camping season. I will not let it escape me this time! Great article and photos. I loved Llanthony Priory, very atmospheric. 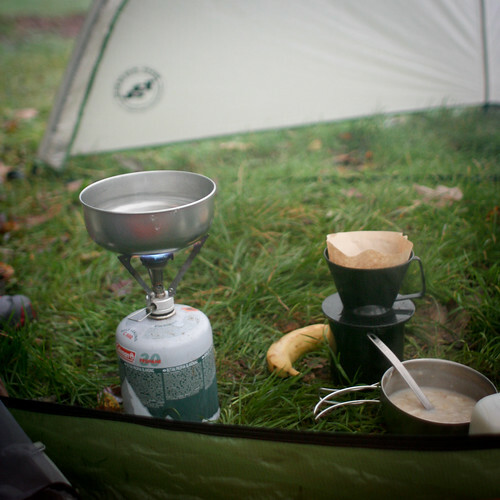 Thanks for the campsite tip – I love the sound of the braziers! 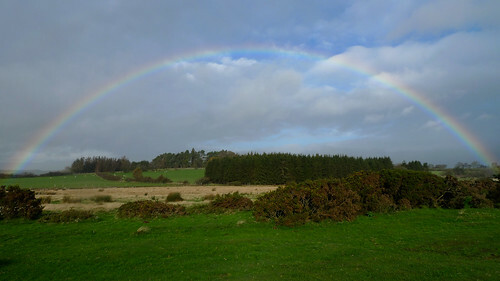 I do think you’re brave though, camping at this time of year, i’m a bit of a fairweather camper myself, although I’ve walked in all kinds of weathers, including sheeting rain in the middle of dartmoor, when I discovered my waterproof trousers weren’t waterproof! Well it’s not so much bravery as me being fed up and annoyed with myself for not going camping this year. Better late than never? If I had it my way, I’d do all my camping in English summer (or in California!). Great post – and it looks like you had a great time, all things considered! We looove camping and walking and we’re kicking ourselves for not having been this year too. I don’t think we’re brave/motivated enough to do it in November though! Well you are in a beautiful spot for both camping and walking but I’m sure the weather is much less friendly this time of year. That reminds me, haven’t been to Scotland in too long. I WILL make it a priority next year. What an incredible day that must have been. This place is like paradise. Would really love to be there too.